As industry pioneers, Honeywell has developed many of the groundbreaking advances that have shaped today's residential and commercial security systems. We made systems easier to install and to use, developed the industry's most reliable supervised wireless products and the most flexible hybrid control panels on the market. We are also on the forefront of advancements in long range radio, Internet alarm communications and sensor technology including the development of the world's best-selling glassbreak detectors. As industry leaders, we've taken safety very seriously for the past 75 years. That dedication has never wavered. We employ a talented team of 300 engineers and continually raise the bar for the future, dedicating millions of dollars annually to research and development. The Vista series panels are a tried and true alarm panel that is useful in residential and commercial applications. With options like: Fixed English, LCD and Graphic keypads, zone expanders, multiple motion and door/window sensors including wireless sensors, keychain controls, life safety devices such as smoke detectors, carbon monoxide sensors and wireless emergency devices, GSM and Smartphone capibility, your Vista panel can handle just about any type of need. As you might expect, every home and business has different needs and wants. 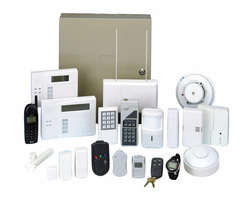 Please consult with a professional security consultant to determine your particular equipment needs.